Catcher J.T. Realmuto during an at-bat at Citizens Bank Park. By now, you likely know that the Phillies acquired arguably the best catcher in baseball on Thursday when they traded away top prospect Sixto Sanchez, catcher Jorge Alfaro and more to the Marlins in exchange for J.T. Realmuto. It wasn't the move that Phillies fans have been on the edge of their seats waiting for — it's true, Bryce Harper and Manny Machado still remain unsigned — but it's a huge deal nonetheless, one that could have a longterm impact on the organization. The soon-to-be 28-year-old All-Star certainly makes the Phillies lineup better, but at what cost? In giving away Sanchez and Alfaro, did Matt Klentak and Co. pay too big of a price for that upgrade? And what does it mean for the Phillies going forward? Here's a look at what the local and national media are saying about the Phillies a day after the trade went down. As Corey points out, there's been a fair amount of debate following the Realmuto trade, most of it revolving around top prospect Sixto Sanchez. But he also correctly writes that Sanchez is a far greater unknown than most Phillies fans would like to admit, whereas Realmuto is not. And Realmuto could get demonstrably better simply by a change of scenery (more on that in a bit). J.T. Realmuto is worth trading Sixto Sanchez. Realmuto is the best catcher in baseball and probably the only active catcher you could argue possesses all five tools. He can hit for average and power, field and throw well, and run the bases better than any everyday backstop. This is where the bulk of the debate lies. Sixto Sanchez was regarded as the Phillies' top prospect and his was the name Phillies fans heard more than any other in recent years. Many did not see Realmuto as a meaningful enough upgrade to part with Sanchez. As we said, not everyone was on board with the Phillies shipping off their top prospect. The Ringer's Michael Baumann is one of those people. Not only does he think the Marlins won the trade, but he thinks the Phillies got fleeced in the deal. Why? Well, you'll have to read for yourselves, but in short, the Phillies have other areas in greater need of upgrades, and they could have made those fixes without trading away their top prospect — or anyone else for that matter. Seeing a trade like this, in which a fringe contender pays through the nose for a marginal upgrade, in which one side so entirely fleeces the other, sends a tingle of nostalgia down my spine. It’s like hearing a Lifehouse song on the radio or spotting a bottle of Jolt cola in the supermarket cooler, as if a bygone era that was more interesting for its ungoverned silliness has reached out a tendril of friendship through space and time. The catcher position is also extremely weak across the majors at this time, at least offensively. Catchers combined for an OPS+ of 87 in 2018, their lowest collective figure since 2001. In other words, this move is arguably the biggest move a team has made this offseason. Before the trade, I had the Phillies a clear fourth in the NL East behind the Nationals, Braves and Mets, and this trade puts them right up there with the Braves and Mets. The Phillies aren't the only NL East team looking to improve this offseason. Several division contenders have already added help — Josh Donaldson (Braves), Robinson Cano and Edwin Diaz (Mets), Patrick Corbin (Nationals) — and that could make for one hell of a race for the East this season. 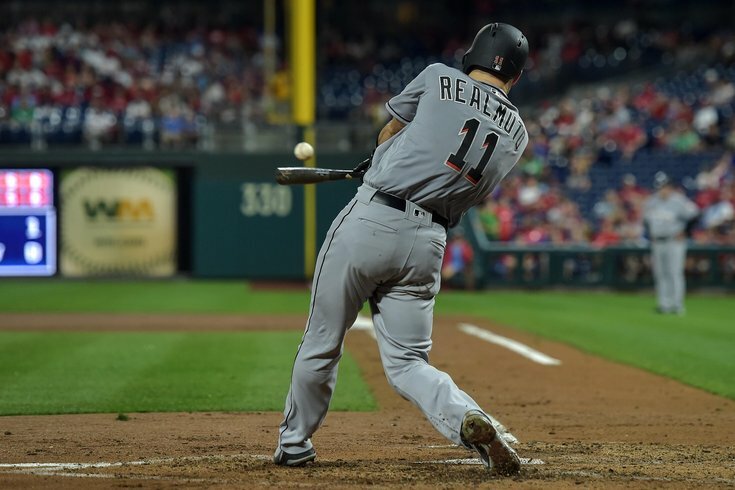 What if by simply leaving Miami for Philadelphia, there's a possibility that Realmuto's bat could get an additional boost? Over at ESPN, they took an even deeper look into Realmuto's numbers to prove how he's a legit five-tool player, something that's extremely rare among catchers. And, of course, he notes that his numbers are only going to improve playing in a more hitter-friendly ballpark — and being surrounded by a much more potent lineup.